We use module system to manage software with multiple versions installed. Currently there are two different versions of R installed, R/3.4.2 and R/2.15.0. You will need ‘module load R/3.4.2’ in your job script for R 3.4.2. Here is a sample job script for running R 3.4.2 where the last line is the command you want R executed in batch mode with MySin.R file. echo "***Ignore Warnings for access to tty***"
echo -n "Changing to directory... "
echo "Our List of nodes:"
echo -n "Loading module mpi/mpich-x86_64....   "
echo -n "Loading module R/3.4.2.... "
echo -n "Finished program at: "
The MATLAB Distributed Computing Server (MDCS) allows you to extend your MATLAB workflows from your desktop to HPCC without having to learn the details of submitting jobs to the cluster. Before you can use MDCS on your computer, we will need to apply a few integration scripts to each computer that you plan to run MATLAB on and submit jobs via MDCS to the cluster. Please contact [email protected] for more details. Depending on the availability of licenses at the time of your request, you can run up to 96 cores in parallel. 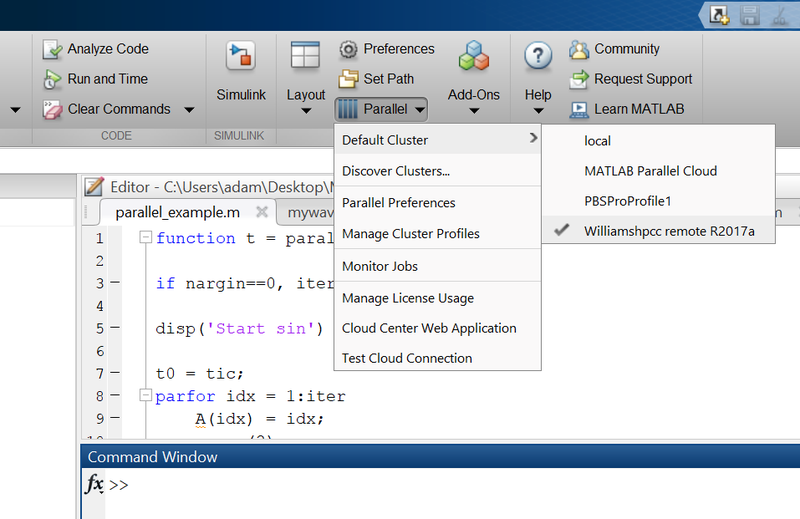 The screen shot below shows how and where you get access to MDCS from your desktop MATLAB after applying the integration scripts to MATLAB on your computer. We use module system to manage software with multiple versions installed. Currently there are two different versions of Stata/MP installed, 14 and 15. You will need ‘module load stata/15’ in your job script for 15 and ‘module load stata/14’ for 14. Here is a sample job script for running Stata/MP 15 where the last line is the command you want stata-mp to run in batch mode and the input do file is MyStataDoFile.do.